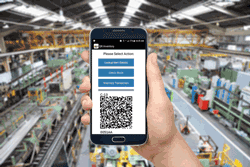 QR Inventory is a connected cloud-mobile inventory management software with barcode / qr code scanning. Easy to setup and use, yet providing all features you need to integrate it into your business workflow and take assets and inventory under control. Have an accurate inventory picture and assets location at all times. Authorized users can access the system from anywhere, on the computers or mobile devices, and always get accurate real time asset and inventory information. Host QR Inventory on our servers or on your company's network. Track assets and inventory in multiple out-of-office locations by scanning QR code / barcode label with a smartphone. No manual entries - scan barcodes, QR codes or NFC tags to record or access information. No hardware to buy - use smartphones to scan QR code or barcode on asset or inventory label. Record asset and inventory transactions on site in real time, and always have accurate data. If barcode scanning with a smartphone camera is not an option, you can use a handheld bluetooth barcode scanner connected to a smartphone. QR Inventory application is natively integrated with bluetooth barcode scanners for the fast, uninterrupted scanning. Use what works better for you: regular barcodes, QR codes, NFC tags. Use existing labels or generate & print new ones using QR Inventory. Scan asset label with a smartphone to access all necessary data: asset technical specifications, installation instructions, drawings, pdf documentation or look up inventory stock and location(s). Fill out custom mobile forms to collect necessary data during asset or inventory transaction. Take photo(s) using a smartphone and attach to the completed form for visual documentation. GPS location of asset and inventory transactions is automatically recorded, and can be viewed in the reports in tabular or map view. Add multiple items to a transaction, fill out transaction form once. Move multiple assets from their respective locations to a warehouse in one transaction. Current location will be determined automatically by the software - no need to specify it for each item. Customize asset and inventory management process to fit your workflow and business model. Create custom fields to hold all required information on your assets and inventory, including images. Your employees can access this info in the field by scanning QR code label on an asset with a smartphone. Create transaction types that make sense for your business (restocking, sale, taken for a project, return, check in, check out, transfer to a different location, lease - anything that is a part of your workflow). Create custom variants (such as size, dimensions, etc.) for inventory to keep track of each variant stock. Create custom mobile forms that employees need to fill out along with inventory or asset transaction. Include anything that you need to keep track of - project, client, due date, item condition upon return, etc., etc. Take photos using QR Inventory mobile application and attach to an asset or inventory transaction for visual documentation. Generate custom pdf receipts for the transactions based on your template. Collect customer signature and include in pdf receipt. View, print, e-mail pdf receipt from a smartphone. Create pdf report for any completed mobile form, on the smartphone or via the web dashboard. E-mail report to the interested parties (co-workers, clients, external auditors). Define what should be in the report (collected data, item information, image(s) and signature), report look and layout using custom templates. Customize main inventory and assets dashboard to get fast access to the important data. Decide what fields to display (including custom fields that you created), and in what order. Search data by any field to produce the results you need. Track assets and inventory in all locations you have, including warehouses, offices, job sites, service vans, client sites, employees, etc. If you have multiple temporary locations that come and go and are impractical to enter in the system, you still can track assets and inventory there. Enter location name manually, or scan it in to avoid errors while processing inventory transaction. In addition to keeping track of asset and inventory locations, you can track exact item location in the warehouse, e.g. shelf 7 bin 123. Track all steps of the manufacturing production process and batches of materials that went into the finished products. Trace materials and parts from the origin to installation or delivery. Create custom worflows, track projects and product batches through workflow steps on a smartphone. Create custom mobile forms that should be filled out at a specific project step. Your employees will see the project history, current step, fill out necessary forms and move project to the next step - all on site, using their mobile devices for barcode scanning, data entry and look up. Receive automatic notifications when project is moved to the next step. Review real time status of all current projects via a web dashboard. Easily find and review an entire history of the current and past projects: who did what when, project movement through the production steps, forms filled out on each step and any problems that might have been identified during quality control. Track parts and materials by SKU, lot number / batch number, or serial number. Create custom fields to hold all required information on each batch. Track what batches or serialized assets / inventory were used for assembling of each product. Quickly locate potentially defective batches and products that contain them. Generate pdf documents for each process and form. Include collected information, image(s) and signature. Create custom templates for PDF look and layout. View, print, e-mail pdf documents from a smartphone. Built-in QR codes labels generation, layout and orinting tool. Use any label printer or regular office printer. Generate QR codes for assets, inventory, and if needed inventory storage locations, one at a time or in bulk. Enter and count inventory on site using a smartphone and QR code / barcode scanning. Bulk import assets and inventory into the system, enter via the web interface or scan in assets and inventory using smartphone as you label them. Taking initial inventory count is easy and fast. Scan inventory as you label it, enter quantity - and data are sent to the cloud and stored in a database. Don't forget or miss anything. Never run out of inventory. Set re-order point for inventory, globally and / or by warehouse, and receive automatic low inventory alerts. Specify due date for rental / leased assets, and get a report listing all overdue items. Set custom reminder(s) to alert you when next preventive maintenance or routine inspection is due. Get an alert when expiration dates are approaching, whether it is a food / medicine expiration date, warranry expiration on the equipment or product, etc. Access and export real time reports on inventory count, locations, transactions history and usage. Filter reports by custom fields you created, producing exact information you need. Multiple reports on inventory stock and locations. Review count by location, item types and groups, item variants. Filter by custom fields you created. Review assets and inventory transaction and movement history. Trace individual items through production stages. Restore what happened to an asset over its lifetime, filter by date and processes. Access monetary value of items in stock, filtered and grouped in multiple ways. Review monetary value of asset and inventory transactions. Use these data to invoice clients for a specific date range or specific project. Review assets and inventory usage statistics. Filter data by multiple parameters. Multiple add-on modules provide additional functionality - pick only what you need. Keep track of equipment maintenance and service history using a smartphone as barcode scanner and mobile data collection tool. Create custom mobile forms for technicians to fill out. Get alerts when next maintenance is due, and more. Build items into assemblies and sub-assemblies with inventory stock adjusting automatically as you do it. See at a glance how many assemblies you can build from in-stock inventory and what needs to be ordered to build specified number of assemblies. Do physical inventory count, asset audits fast and error-free by scanning assets and inventory in with a smartphone. Scanned data are sent directly to a secure cloud, never misplaced or lost. Discrepancies reports are generated automatically. Eliminate manual work, reduce employee-hours and increase accuracy of the process. Automate creation of purchase orders and invoices based on inventory stock and transactions. Receive purchase orders and automatically replenish inventory. Keep track of the invoices and payments. Reserve assets for the upcoming events, projects or for the client. Place reservations on a smartphone or via a web dashboard. Scan QR code labels to add assets to the reservation, or search by keywords. Control assets check out and check in. Take photos and attach them to inventory and asset transactions for visual documentation. Obtain customer or employee signature. Create pdf documents for inventory transactions, view, print or e-mail from a smartphone. QR Inventory is integrated with QuickBooks®, Xero® and Intacct®, and has its own accounting module.